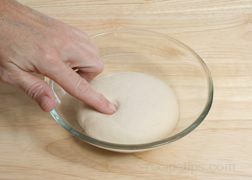 A term used to describe an intermediate stage in the preparation of a sourdough starter in which additional flour and water are added to a small piece of dough, known as a chef, which has fermented for at least two days. The flour and water are kneaded with the chef, which forms a larger portion of dough that is allowed to ferment for at least a day. It is at this stage that the starter dough is known as a levain.